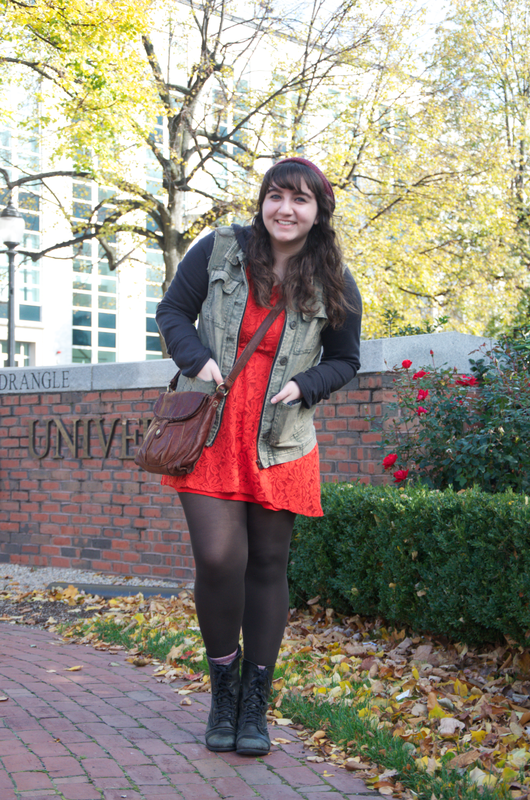 Campus Chic — Carly G.
As Boston begins to transition from warm, sunshine-filled days to brisk, chilly, daylight savings autumn weather, fall clothing trends must adapt accordingly. November is here and the days are getting shorter, but don’t let that discourage you from expressing your style or jumping right into winter clothes. Build your outfits a bit warmer with knit hats, scarves and wool socks in those fall boots! How would you describe your style? : Eclectic! Differs on how I feel. I’ve been told several times before that it’s classy indie/hipster. I’ve also been told that it’s all eclectic but it somehow all comes together. How did you put together this outfit? : Six out of seven days of the week I wear some sort of dress or skirt with tights. I love tights. I live in tights. The orange dress was calling out to me today. I absolutely love the lace! It’s so autumn. The jacket is perfect for the warmer fall days — it’s light enough to be able to wear to help pull an outfit together while still being comfortable. A hat is a must for me in the colder seasons, so I’ve always got one of those on as well. Next Campus Chic — Anh L.